It’s been such lovely weather here the past couple of days! We just made it through a really cold spell right around Valentine’s Day and actually got some snow… more snow than we’ve had in these parts in about 21 years! 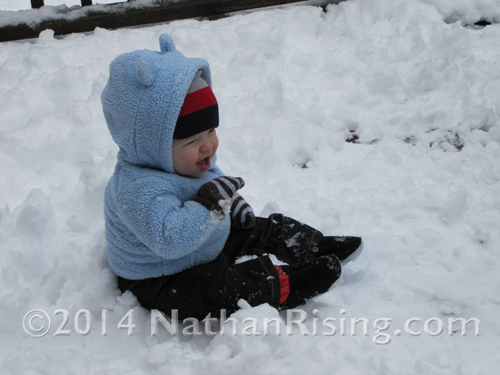 The last time we got a decent snow, Nathan was the same age as John is now. Only we only got about half as much then as we did this last time. So Paul and Nathan went sledding a few times, and when it was time to build a snowman, I bundled John up and plopped him down in the snow right next to the snowman. He spent the next 20 minutes excitedly slapping the snow around while making all those cute little baby noises he likes to make. It was precioius. 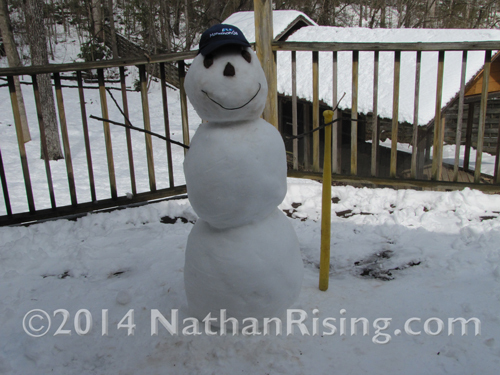 Nathan helped Paul build the snowman and they even gave him eyes, nose, a mouth, arms, and a hat. The kids loved it! I don’t even think John knew what it was, but heck, he loved it anyway. Pure crazyness! Look at all that SNOW!! 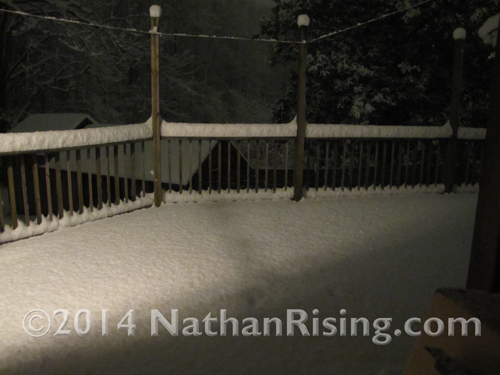 This was taken at night, before the snow had a chance to fall off the rails. We measured it at 8 inches. EIGHT!! The next day, the boys had a blast playing in it. Even John loved slapping his multi-layered sock-covered hands around in all that lovely fluffiness! 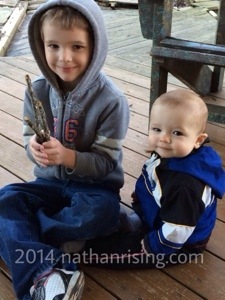 Nathan being an awesome big brother and taking care of “his baby” (As he likes to call John.) 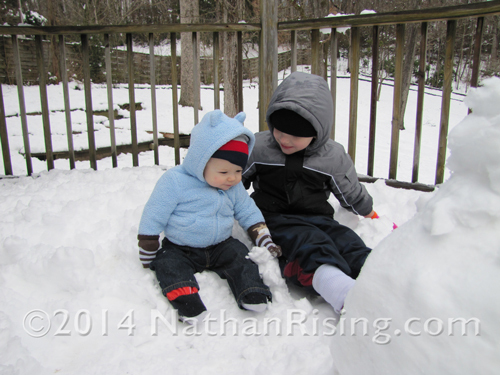 Nathan is wearing my gloves- they’re a little big on him, but they got the job done! 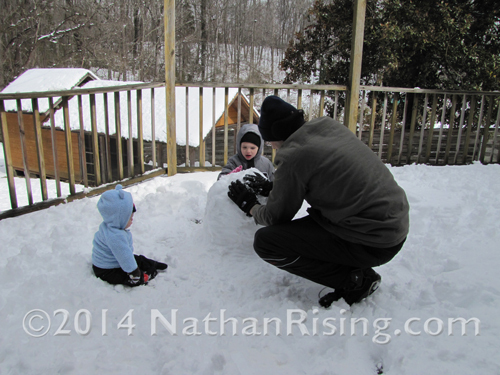 Nathan loved helping Daddy build a snowman. John diligently supervised. The finished snowman. Nathan named him Anakin. A cup of delicous hot chocolate and marshmellows to knock the cold from his little bones. 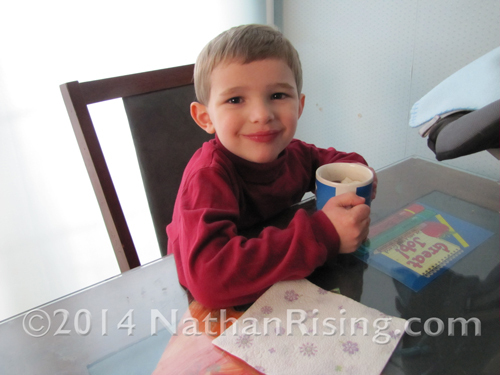 Nathan’s not much on sweets, so he drank about 1/4 of it before declaring he was done. 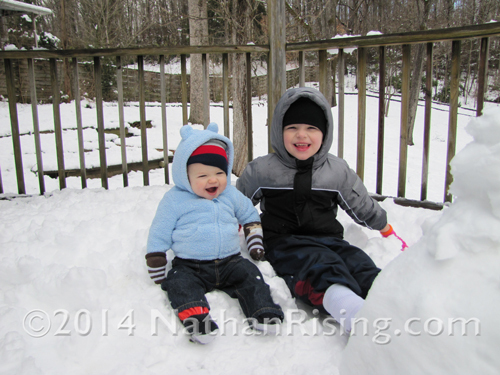 So the weather has warmed up the past few days, and I’ve been taking the boys outside to play. Because we have a yard! A YARD! A big ole yard with lots and lots of room to run. Our last place didn’t have much of a yard at all, and it was dangerous because of how close we were to the busy road. So at any rate, John and I mostly sit on the deck while Nathan runs around and pokes sticks at random inanimate objects. 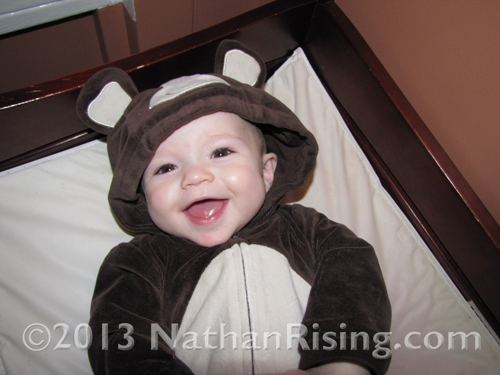 Nathan is a brave little boy, however. He’s had a bad habit lately of trying to sneak out of the house to go outside and play without telling me. And just the other day, I gave him the ok to go out and play but while I wasn’t looking, he snuck out of the backyard. After just a couple of minutes of not hearing him, I knew something was wrong, so I ran outside but couldn’t see him. 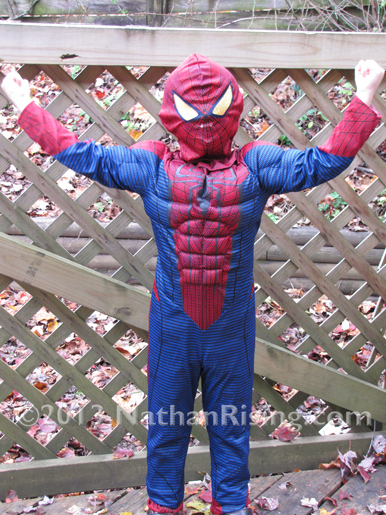 On a hunch, I ran to the front yard and lo-and-behold if he wasn’t walking down the street, waving a stick in the air and talking to himself. That scared the liver out of me, as my mom used to say. Holy cow. After I brought him inside, I tried talking to him and explaining why he is never, ever, EVER allowed to do that. Anything could happen. He could be hit by a car or someone could try to take him. Paul also talked to him about it as well, but Nathan just doesn’t understand the gravity of the situation. 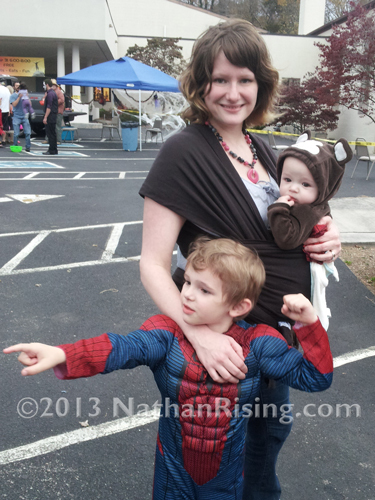 He told me later that night that if an adult tries to take him, he would punch and kick and put the adult in Mommy’s car. Oh my sweet boy. The best I can do is talk to him about it over and over and over again, until it’s ingrained in his head that he cannot ever go anywhere without Mommy and/or Daddy, and especially nowhere with a stranger. No matter what. Anyway, I’m just thankful I caught him in time. And thankful for my Mommy Intuition that told me it was too quiet out there. Boys. So full of life, wanting to explore and be independent. I love my boys and wouldn’t have it any other way! Life is good.